Benefit Cosmetic's eye shadow primer called "Stay Don't Stray." I got a sample of this stuff last year with a Sephora order and immediately fell in love with it and had to make another Sephora order to buy a full sized one. This is without a doubt the best eyeshadow primer I've ever used, and trust me, I've tried a lot. It is the perfect consistency...not too dry or clumpy, but not too wet & sticky. It gave my shadow great staying power and it stayed 100% crease free all day long! 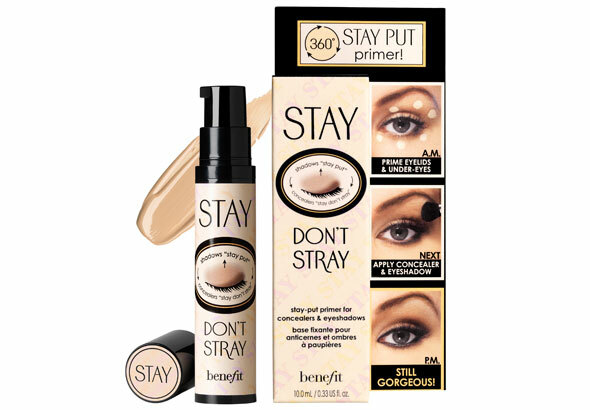 Before using Stay Don't Stray make sure that you start with clean, dry eyelids. You should never apply your foundation to your lids at all, and this will only cause your shadow to crease even more. To apply, dispense a small amount onto your finger and dot it onto your eyelid and corners of the eyes, and then dab it gently until it is evenly blended. After I do that I usually let it set for a minute or two before I put on my shadow, that way I can make sure it completely dries and sets. After that you simply apply your eyeshadow like you normally would, except it will go on a lot more smoothly and you won't have to worry about creases or caking at all. It will stay put all day. Have you ever had a shadow color that looked beautiful in the palette, but then it never looked quite the same once you put it on? That's because most people's eyelids are slightly discolored due to veins and broken capillaries in the skin, and Stay Don't Stray is going to even out the skin tone on your lids to give your shadow a truer, more intense color when applied! So, how much is this stuff going to cost you? It's $26 for a .33oz tube. It sounds a little pricey, but I just checked my Sephora order history and it says that I ordered this stuff in March 2010, and I still have the same tube of it in my makeup bag! That means it's lasted me a year so far, and I use it every single day, and who knows how much more is still in there! I just checked at Sephora and they have a little kit for only $2 more with a full sized bottle of Stay Don't Stray, a small pot of this awesome concealor called Erase Paste and a small pot of a cream shadow by Benefit as well. Pretty sweet deal if you ask me! Especially since you still get a full sized eye primer in the kit! 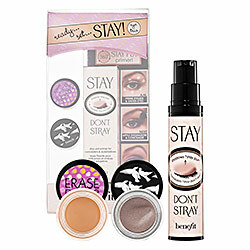 So run out to Sephora or get online & order yourself some Stay Don't Stray and I promise you won't regret it!